My artistic journey has been one of many ups and downs and even long breaks. Since I was little art was a part of my life and I was lucky enough to have parents, especially my father, recognize something in all of my sketches and doodles, which often caused me to be scolded by my elementary teachers for "ruining" all of my notebooks. For the last few years living in Canada I have been lucky to be able to give myself fully to my art and create a full time career out of it. This is why it was so special for me to hold my first solo show (in a commercial gallery) back home in Colombia where my family and my parents could come and for the first time see my work in such a professional context. 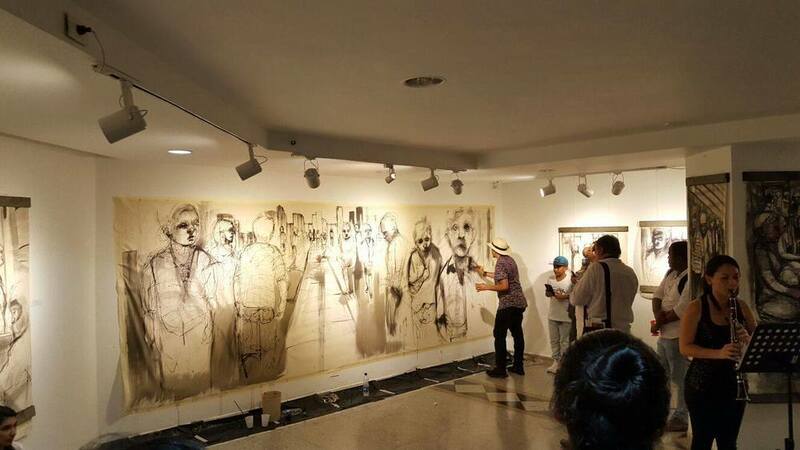 I want to say thank you to all of my family and friends for support and for Gallery Carlos Drew Castro in Pereira at the Institute for Culture and Tourism in Colombia for inviting me to show my series Being Human in the System at such a beautiful space in the Museum of the Institute for Culture and Tourism. Below is a small selection of photos from the opening night which opened up with a large scale 7 ' x 12' live painting of one of my biggest Being Human in the System pieces yet.